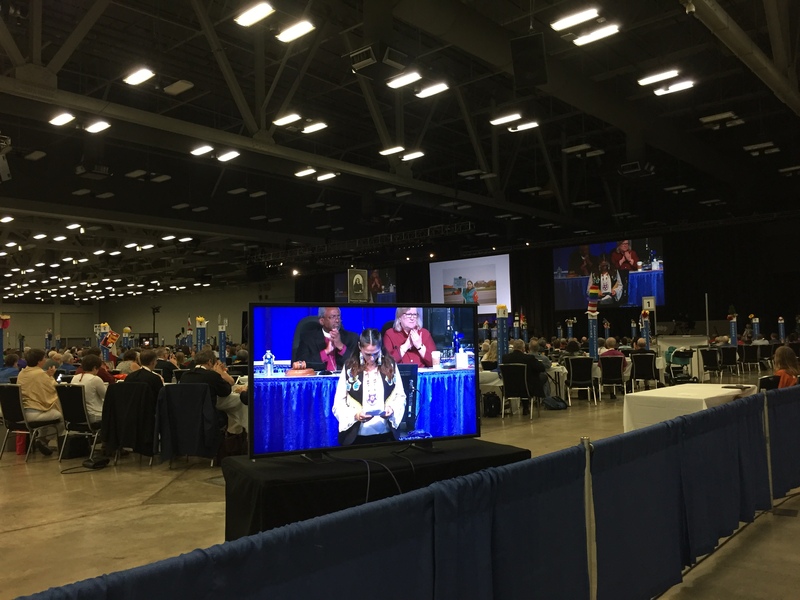 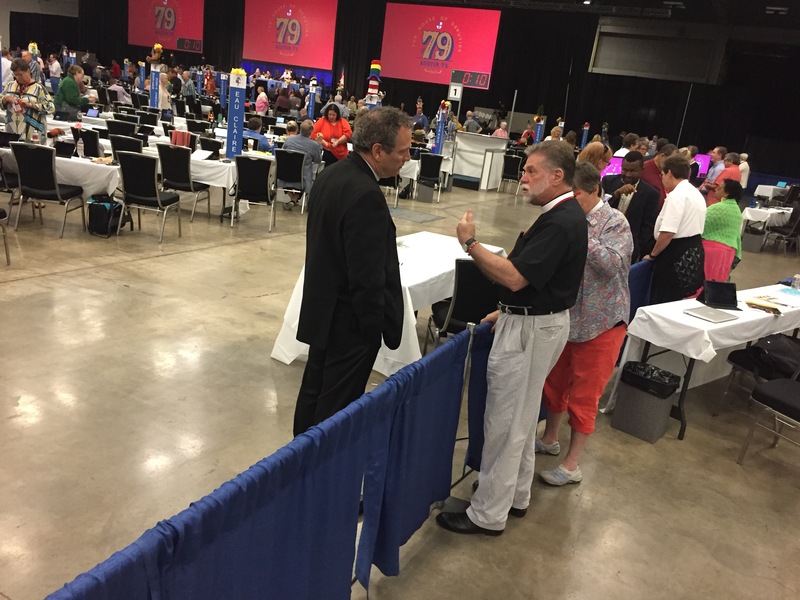 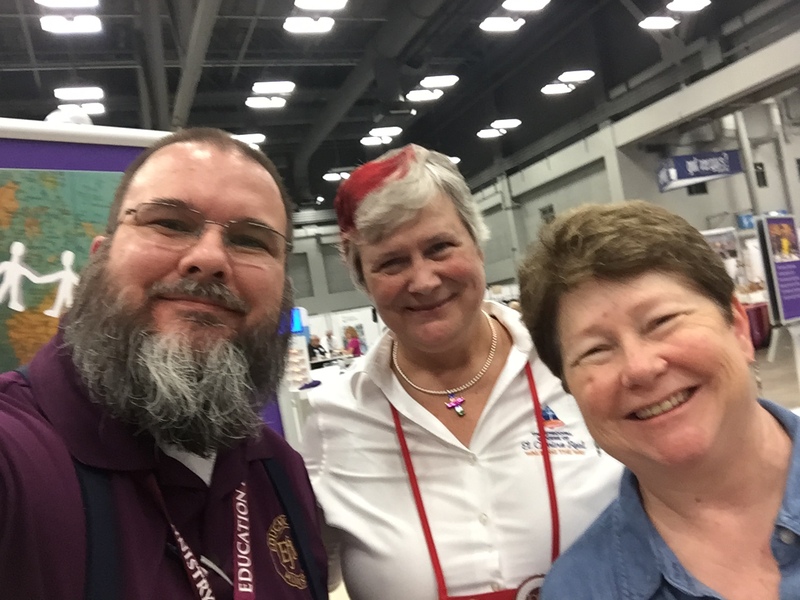 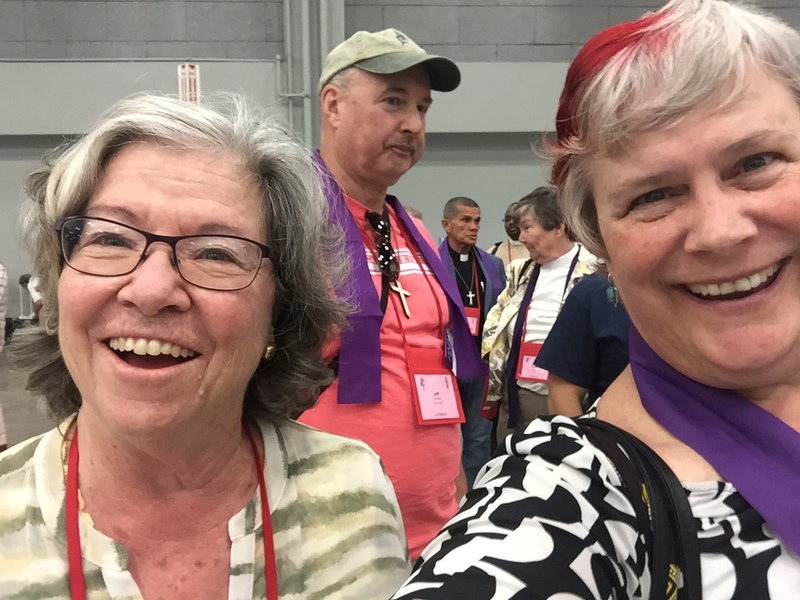 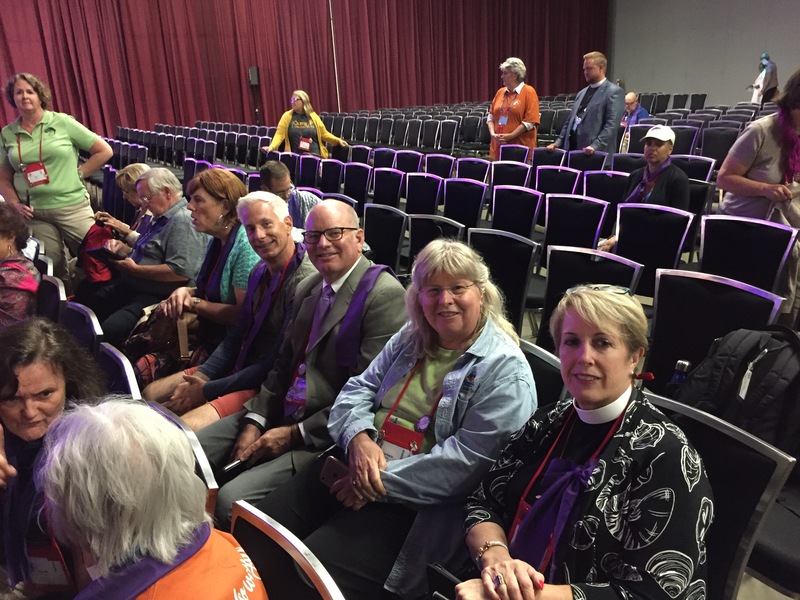 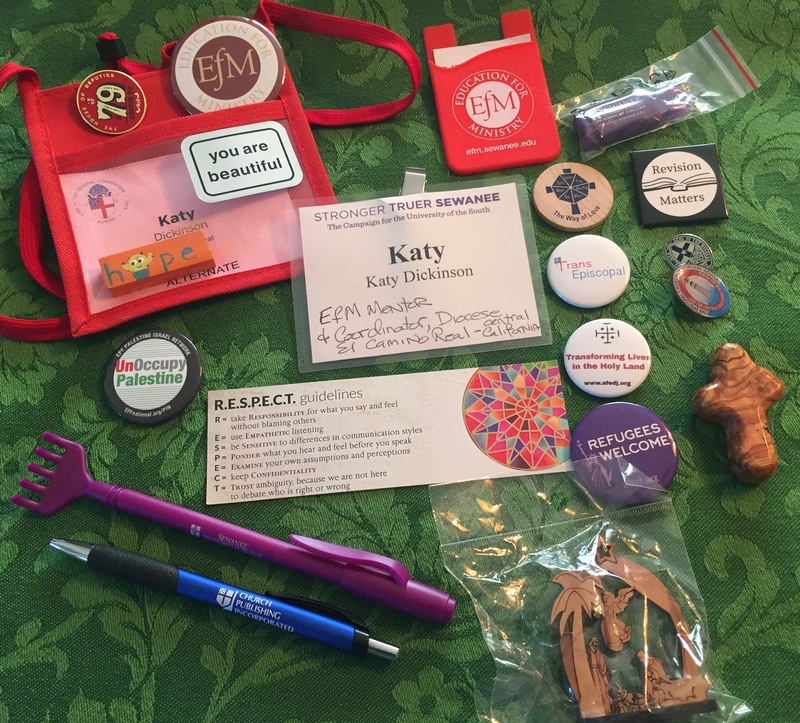 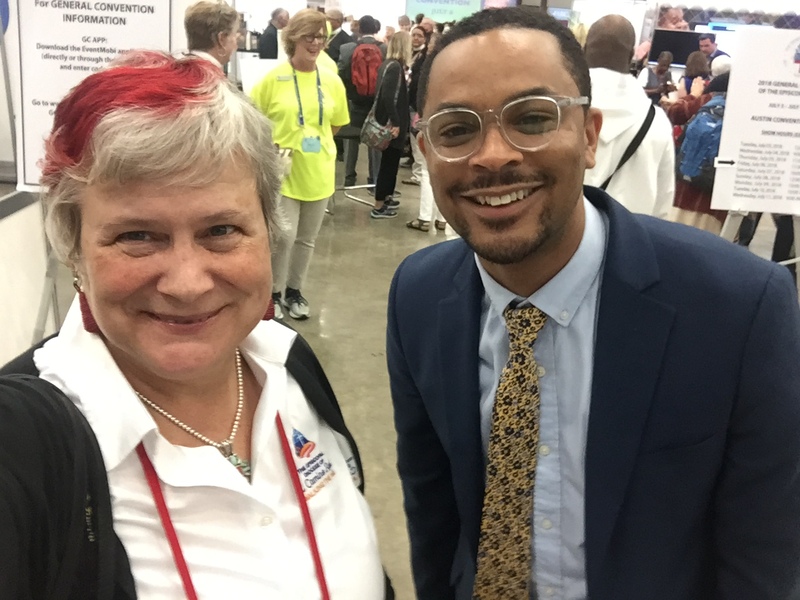 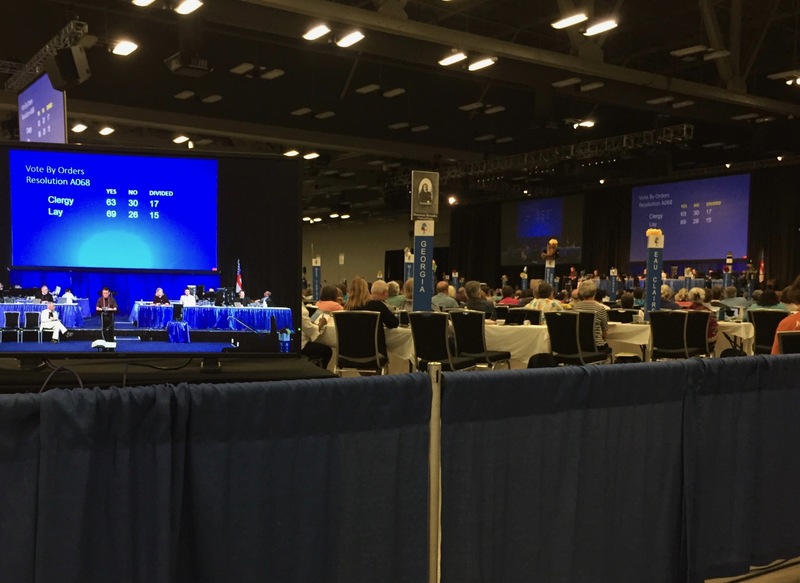 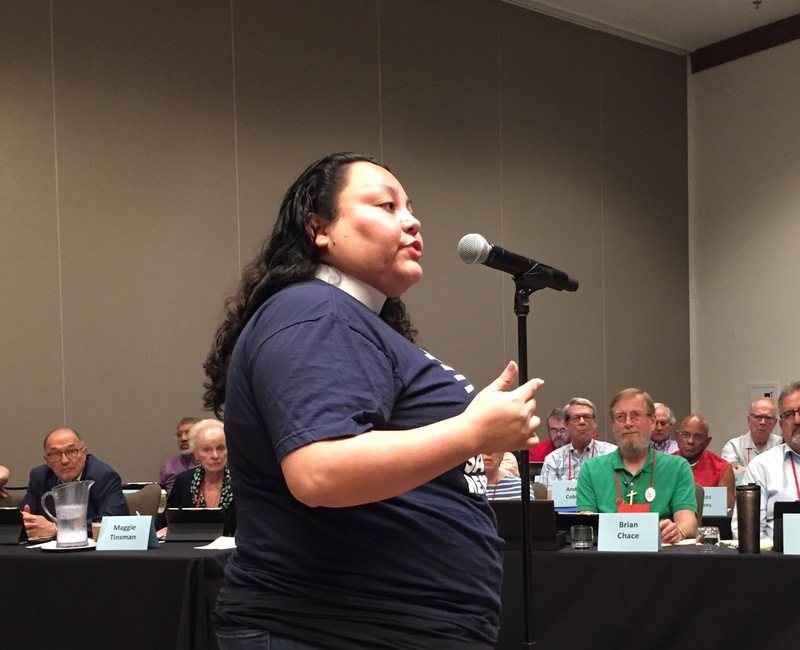 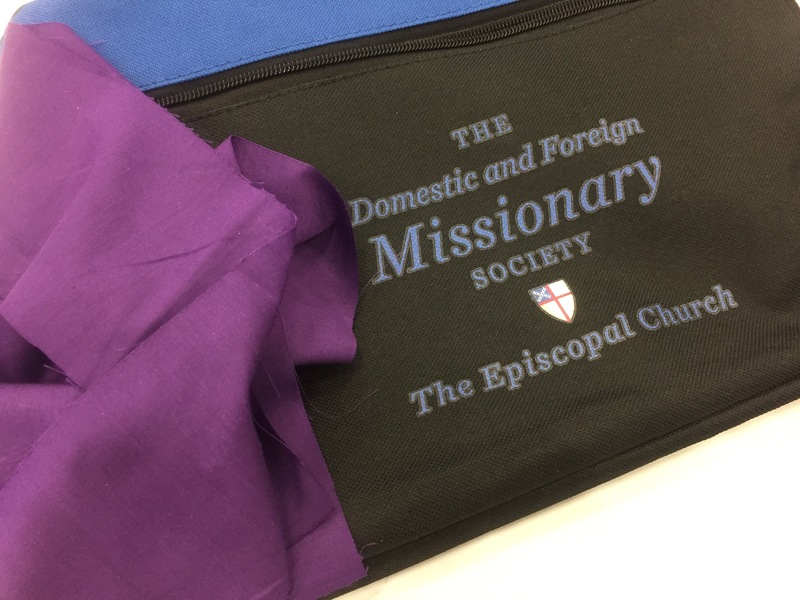 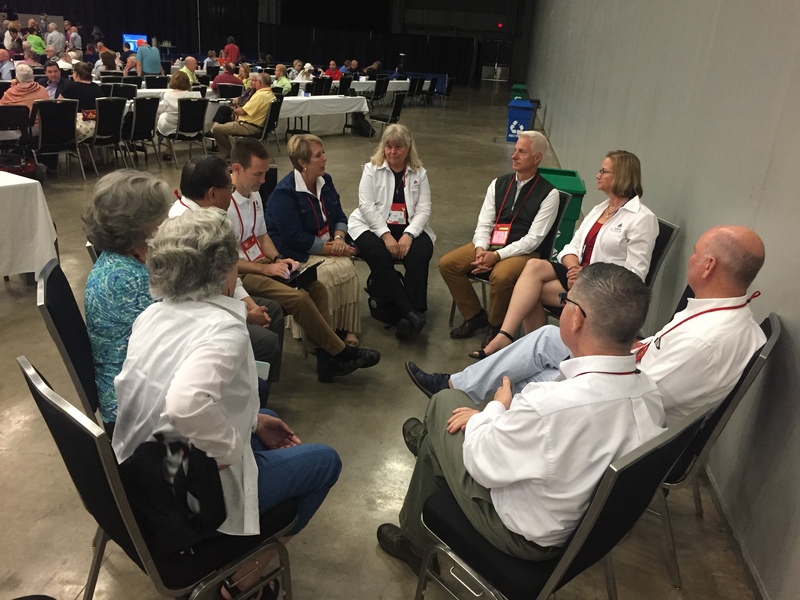 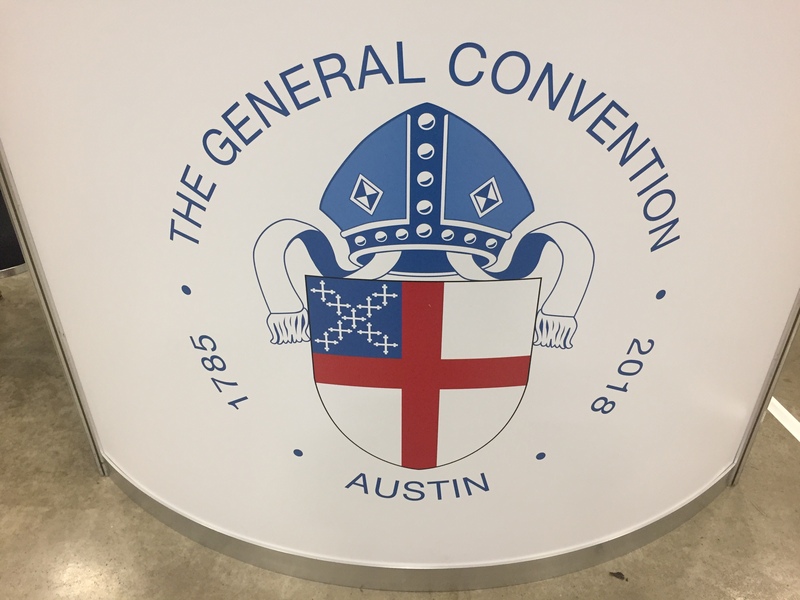 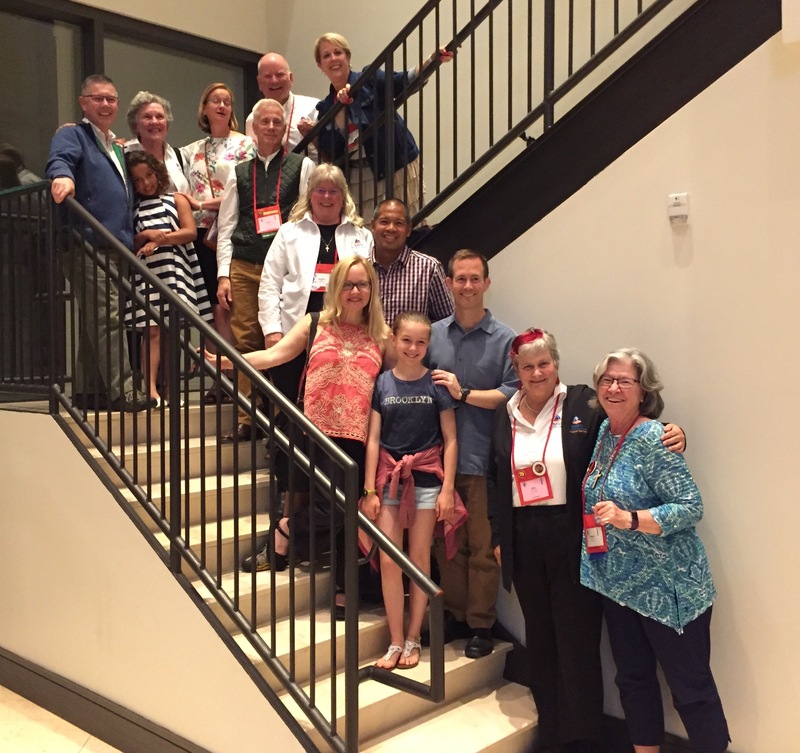 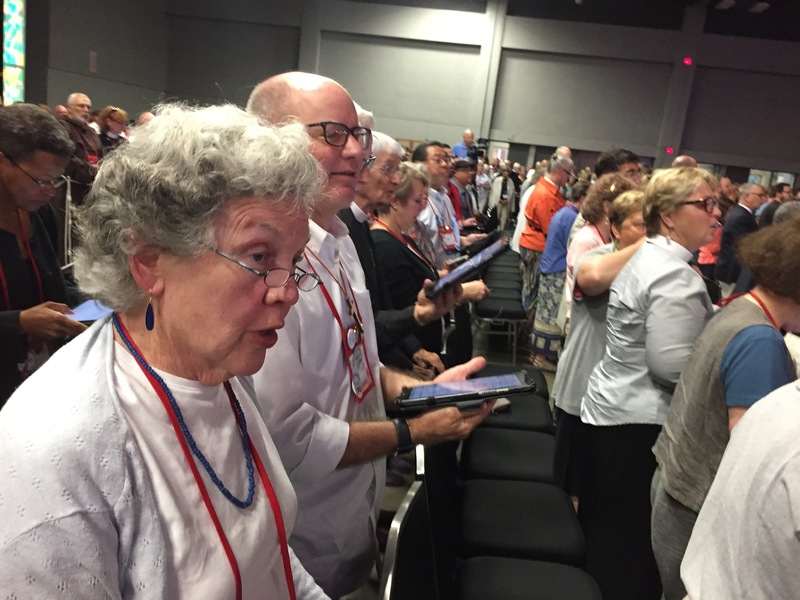 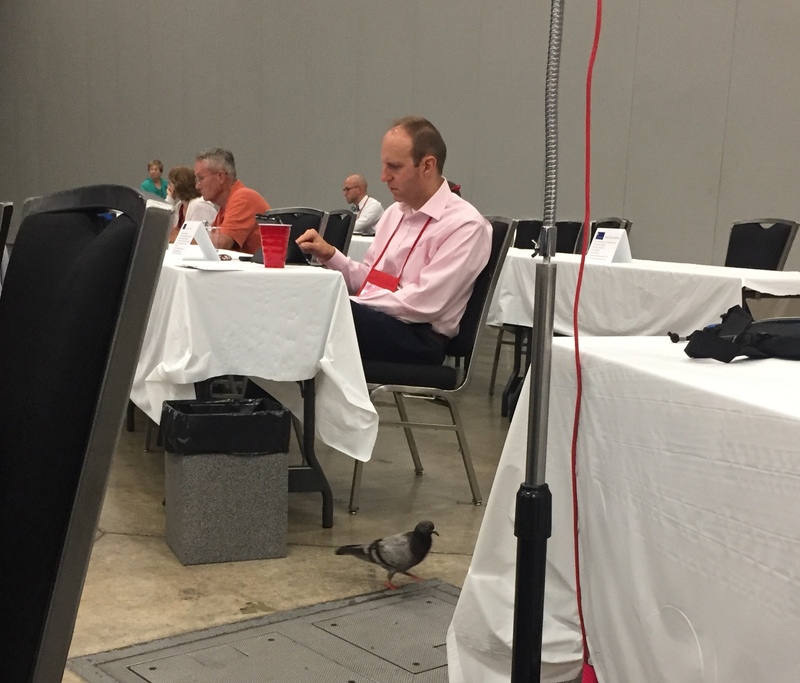 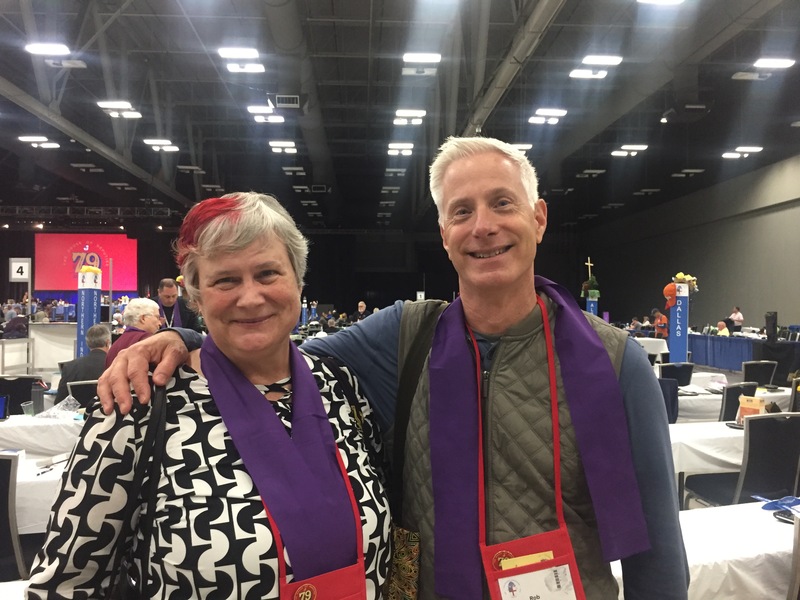 This was the third legislative session day of the 79th General Convention of the Episcopal Church “GC79” (in Austin, Texas). 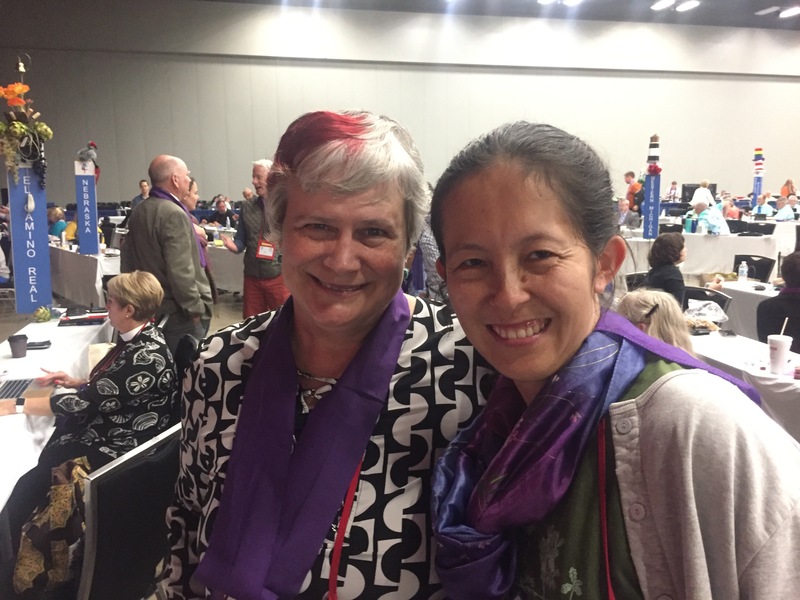 I am with the Deputation of the Diocese of El Camino Real (Central California). 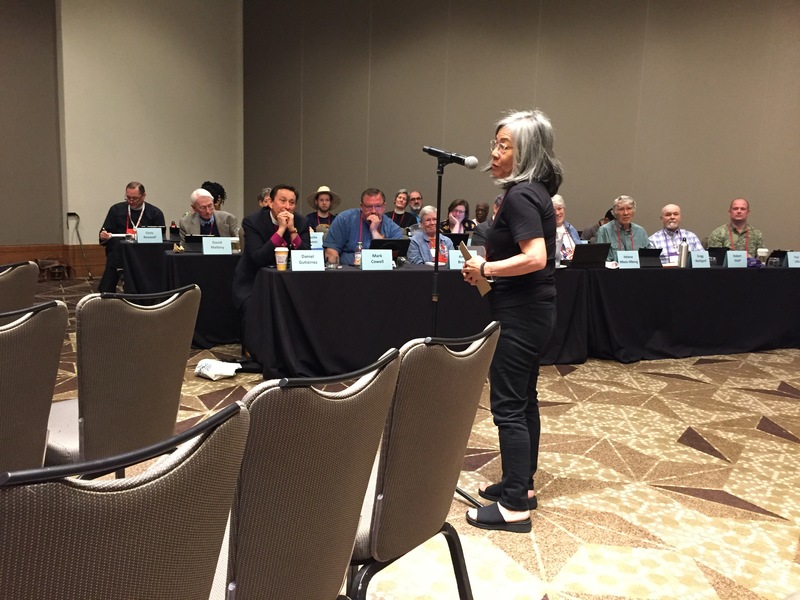 I started today at a hearing of immigration and refugee issues before the Committees on Social Justice Policy. 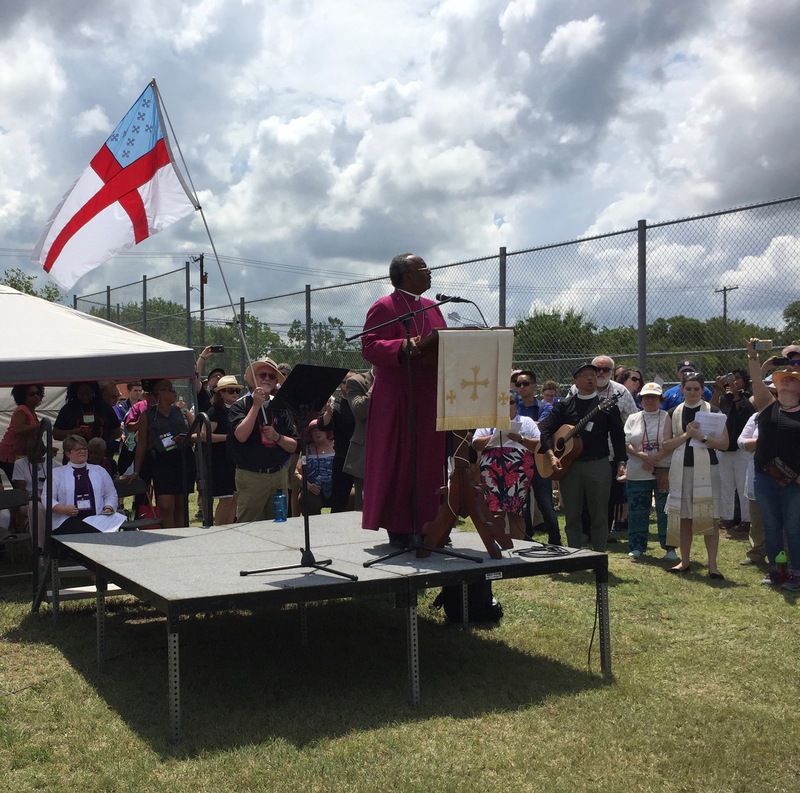 Particularly moving were the stories of the Rev. 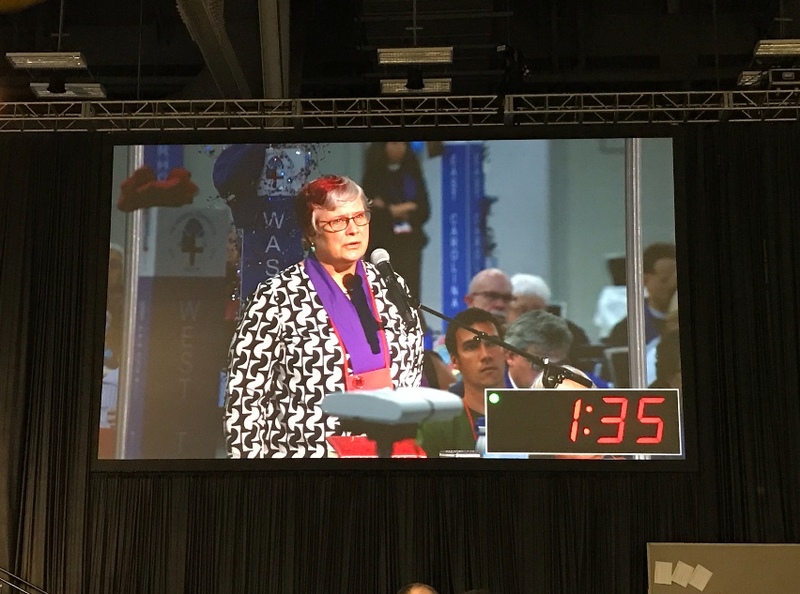 Nancy Frausto of California on behalf of the Dreamers and of the Rev. 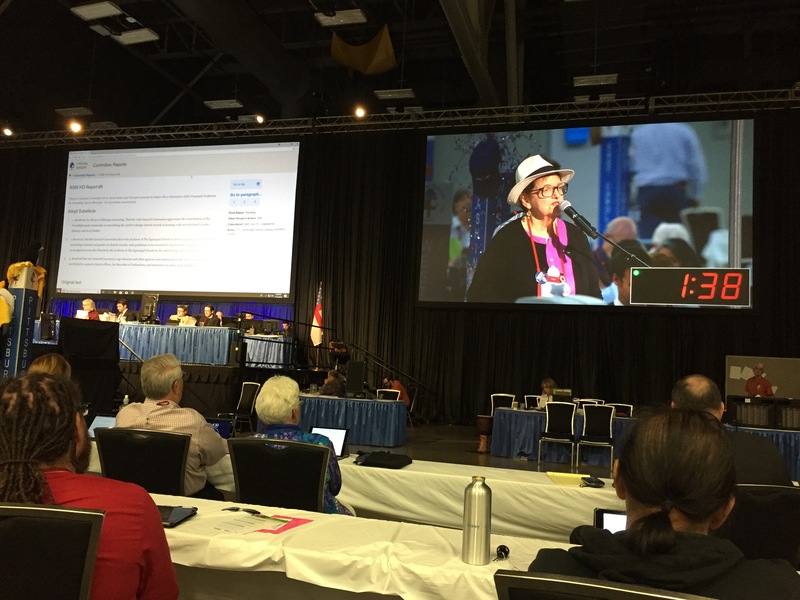 Irene Tanabe of Hawaii who said “Let it never happen again” speaking against the path America is on toward another system like the Japanese American Internment 1942-1946. 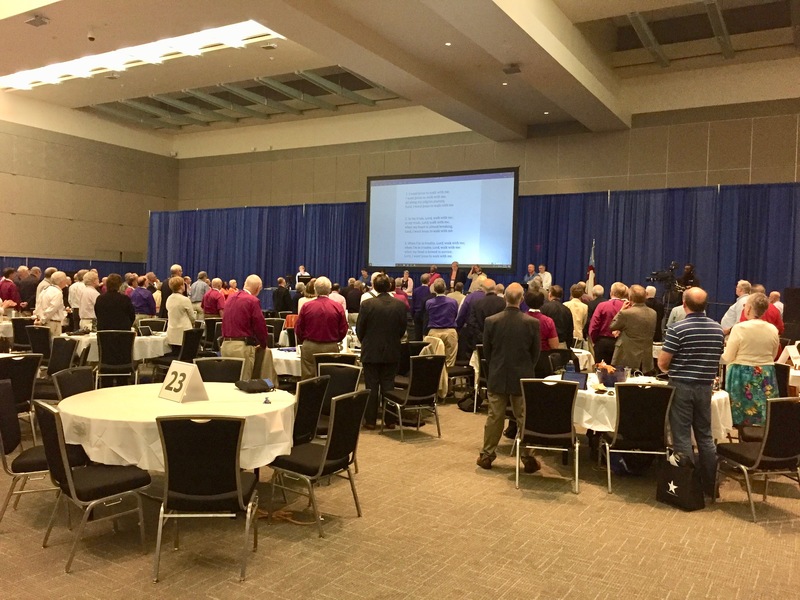 During the morning legislative session, the House of Deputies and House of Bishops met in joint session for a discussion of evangelism. 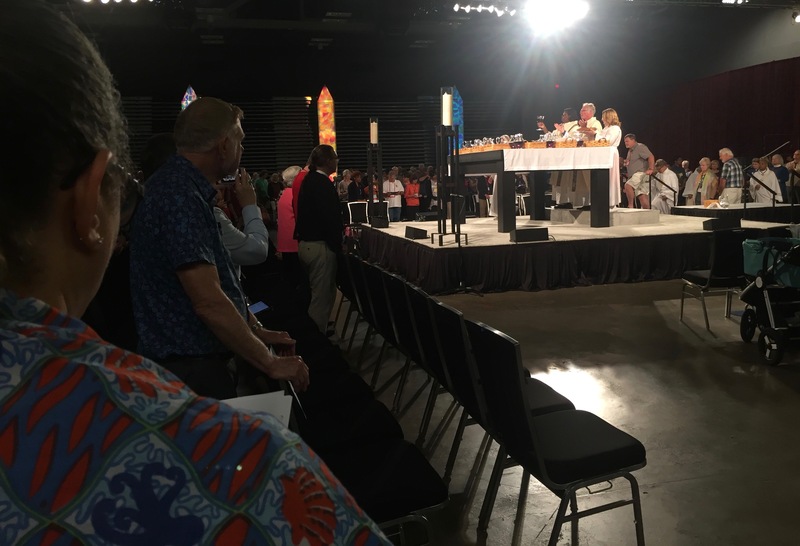 During the afternoon legislative session, A068 (the resolution to revise the 1979 Book of Common Prayer or BCP) was passed by the House of Deputies after long and passionate discussion. 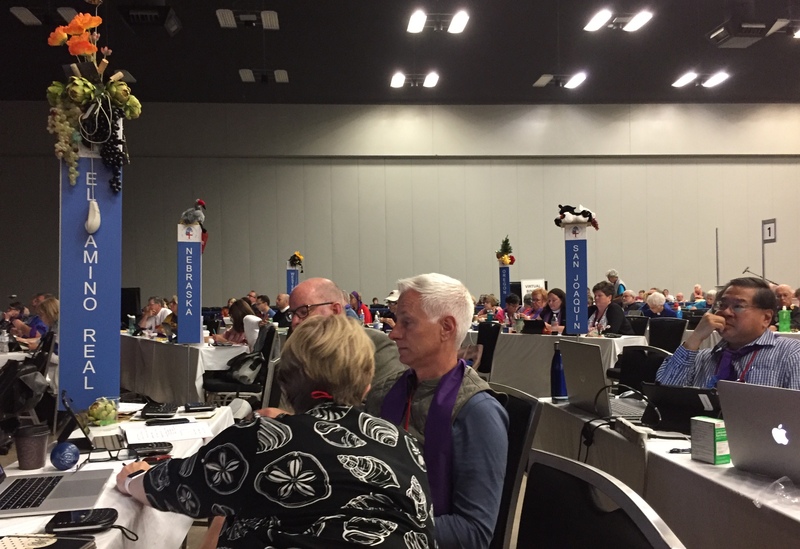 48 speakers were carried over from the long discussion queue of yesterday. 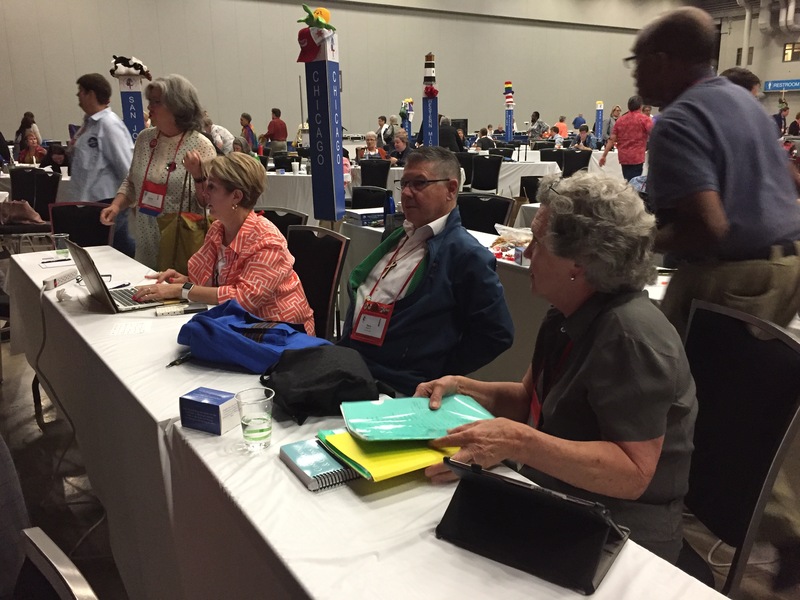 The BCP revision will take about ten years and will be published in English, Spanish, French, and Haitian Creole. 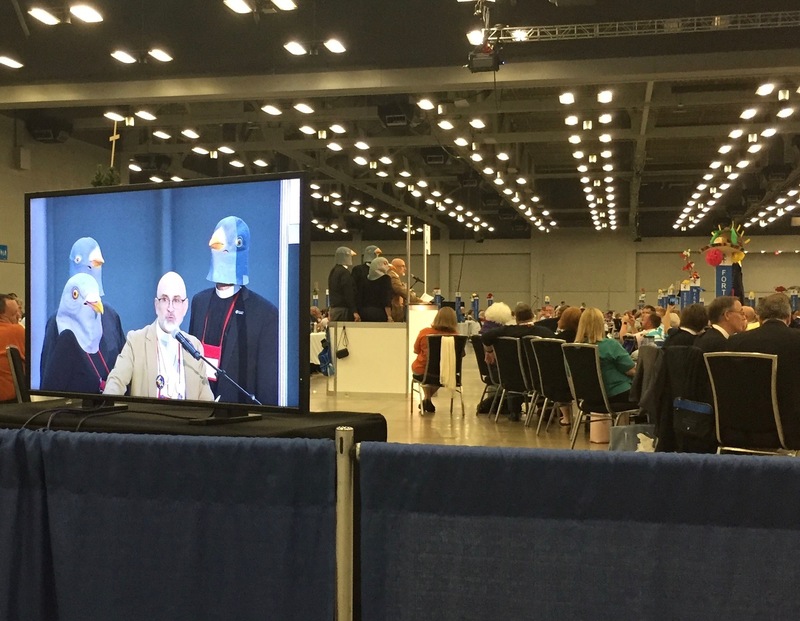 This still needs to be passed by the House of Bishops. 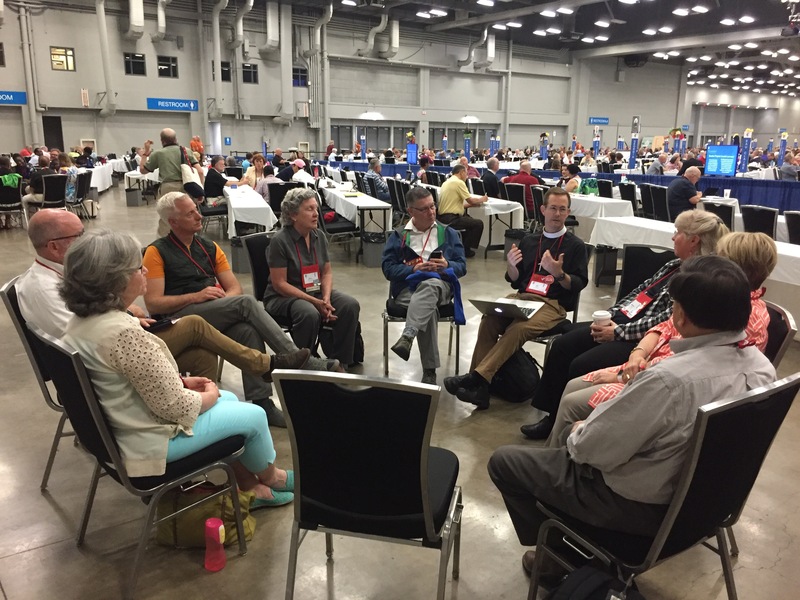 Since 1549, the BCP has been a venerable, remarkable, and elegant source for liturgy, process and prayer. 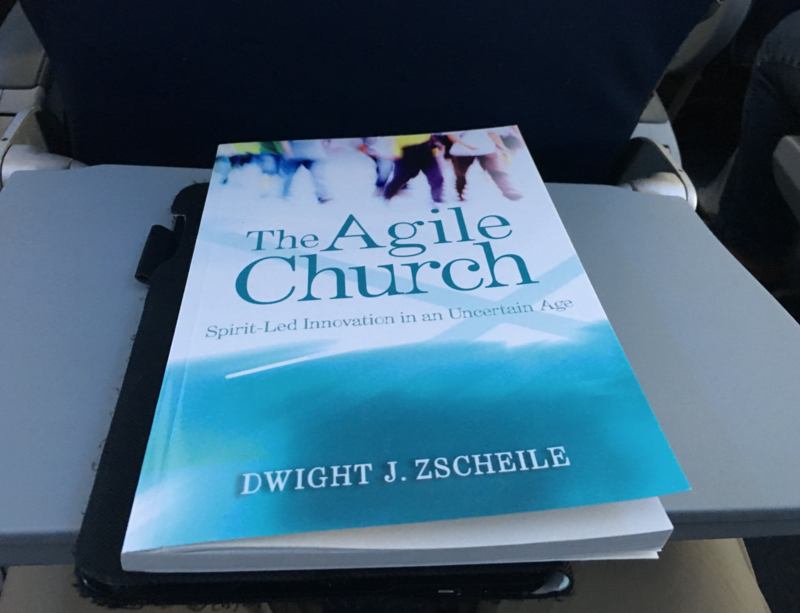 It is also a book I use many times each week during my classes in Elmwood jail. 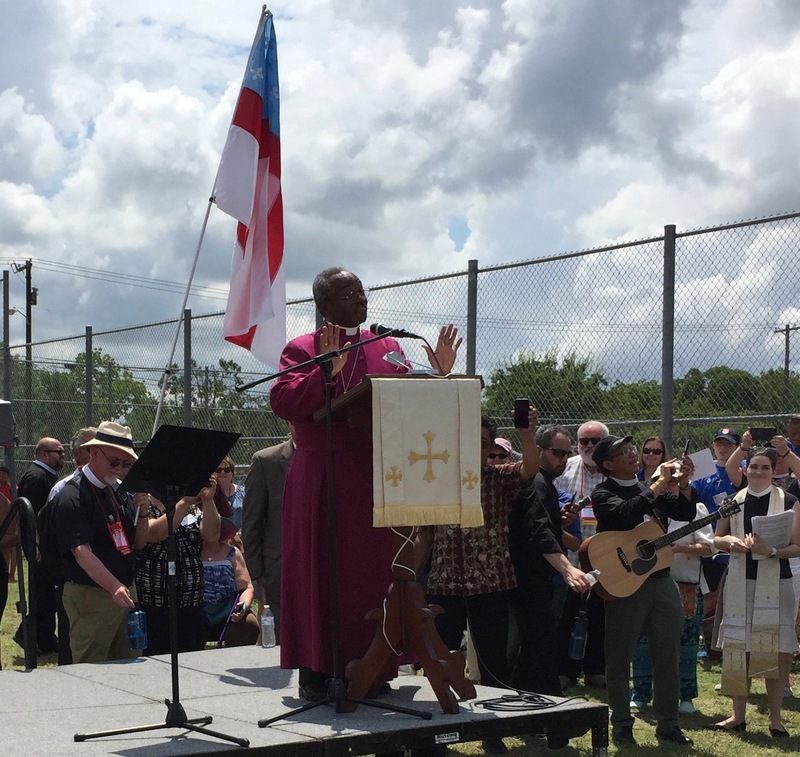 Jail is an environment thick with distrust for authority and with conspiracy theories. 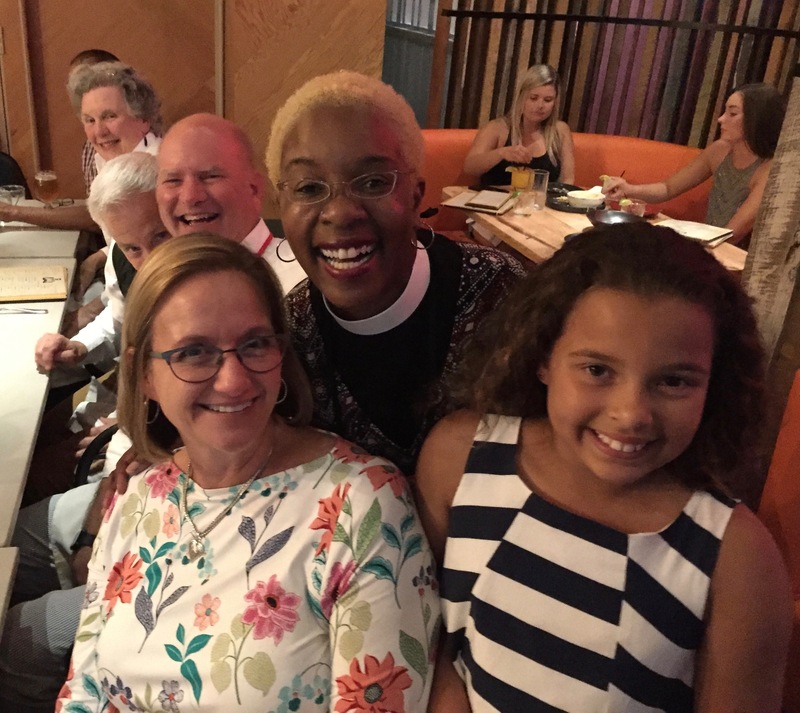 Being able to hand each inmate-student the main source for our church’s liturgy, process and prayer and to tell them that they now have the same material as everyone else is powerful. 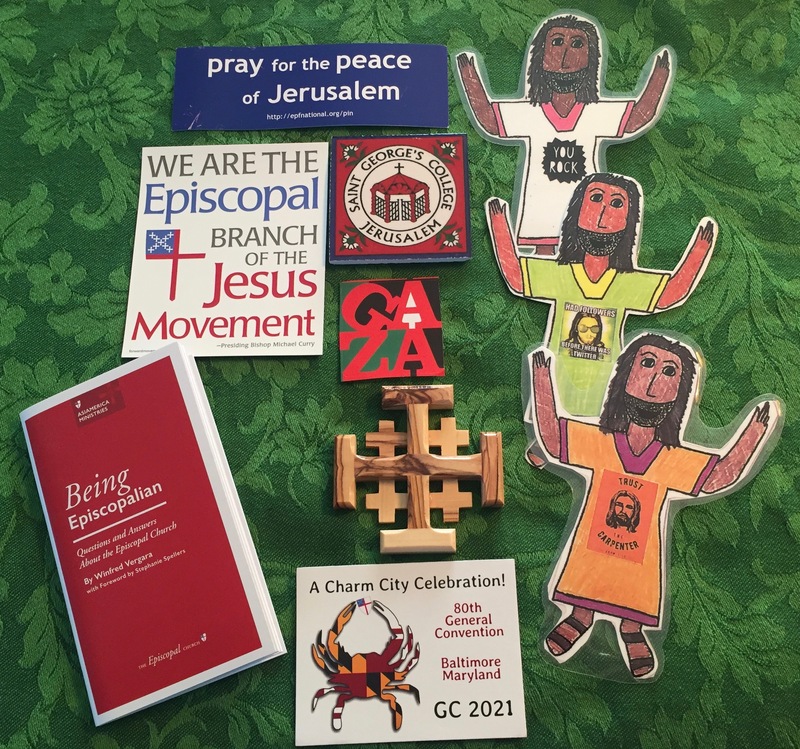 The simple transparency and trust inherent in the BCP is inspiring. 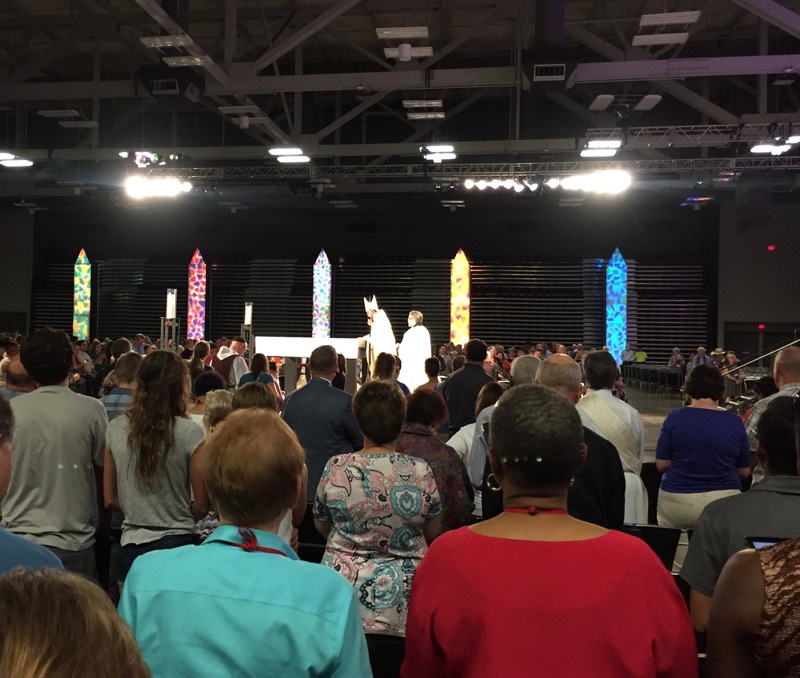 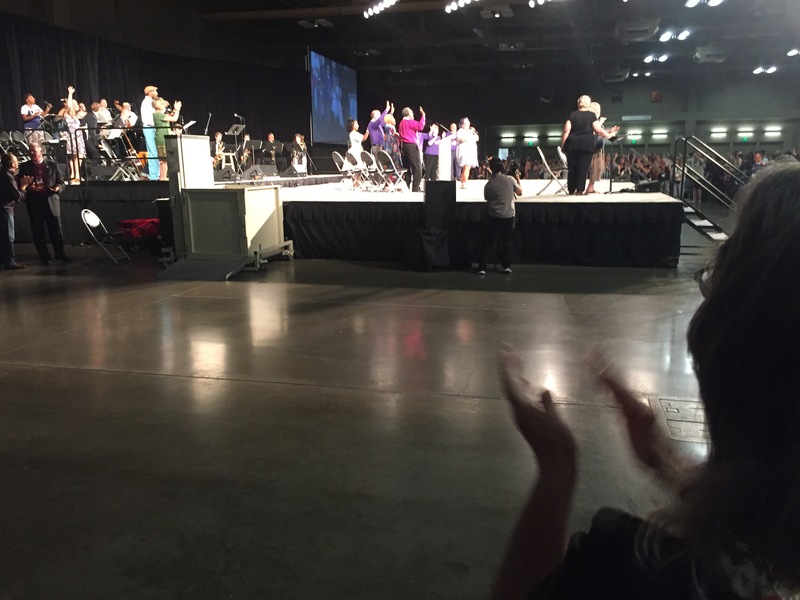 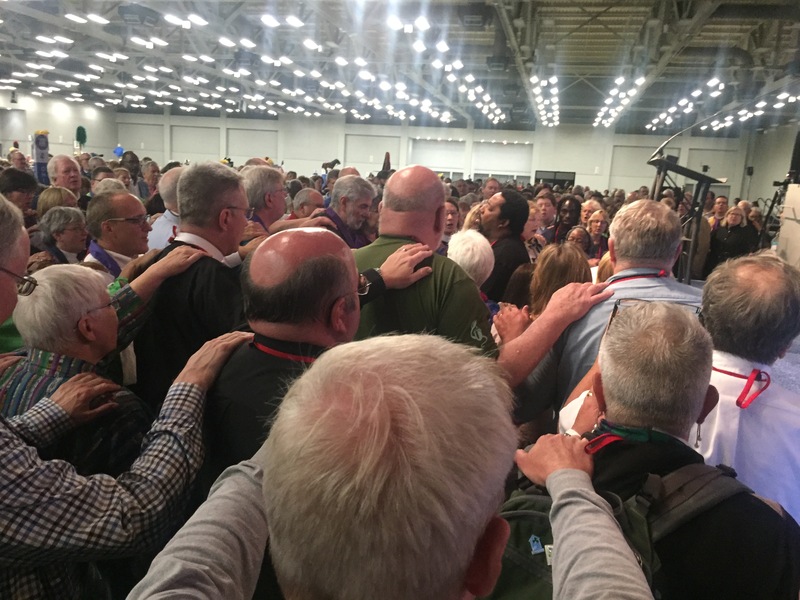 In the late afternoon, GC79 moved from the Austin Convention Center to the Palmer Events Center for a Revival. 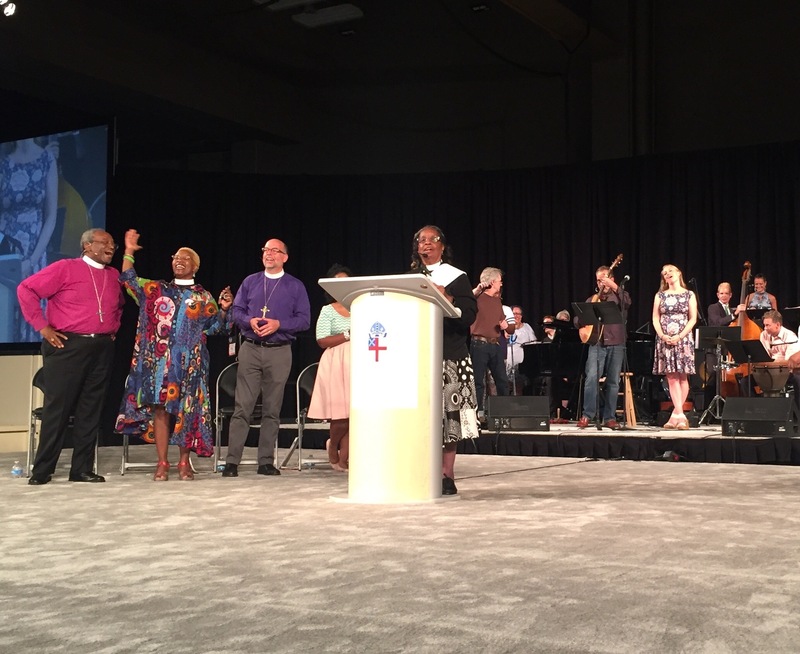 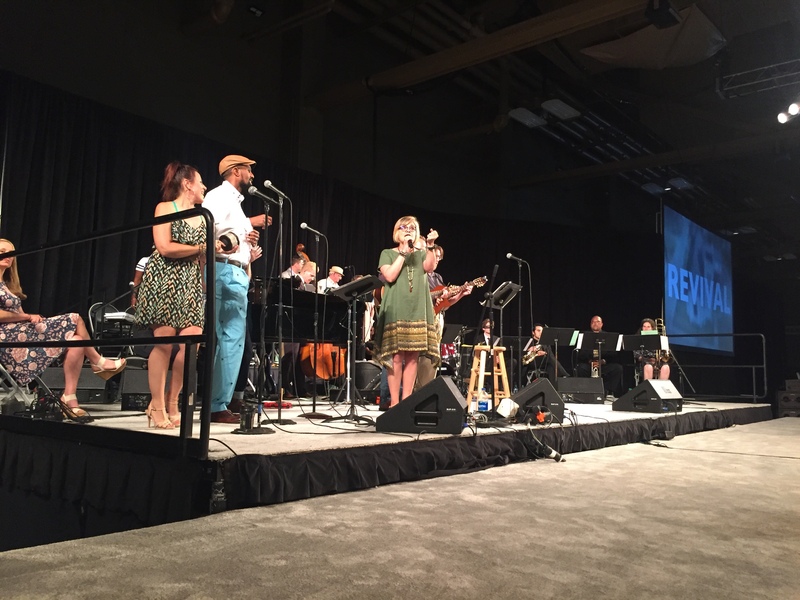 This featured exhilarating music and a rousing sermon by Presiding Bishop Michael Curry. 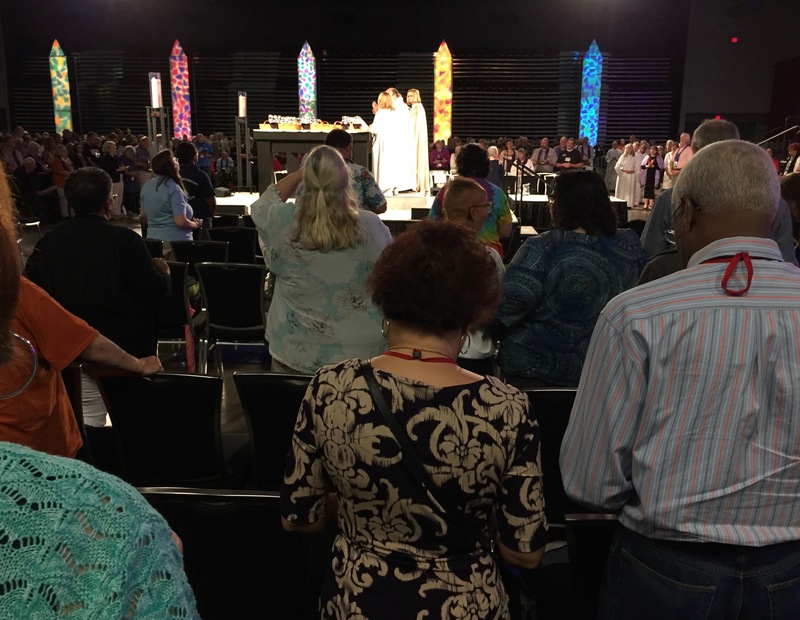 At one point, a blue haired Latina singer was dancing with the stage full of bishops. 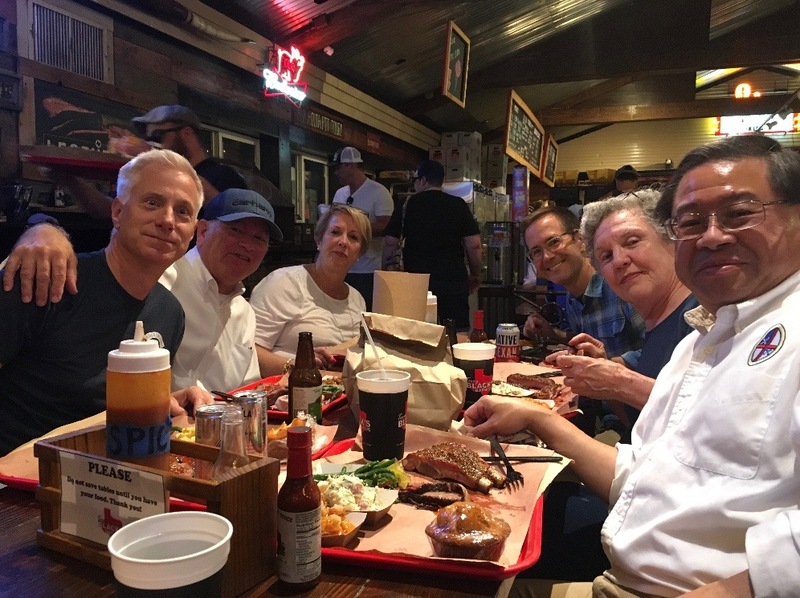 The Revival was followed by a barbecue. 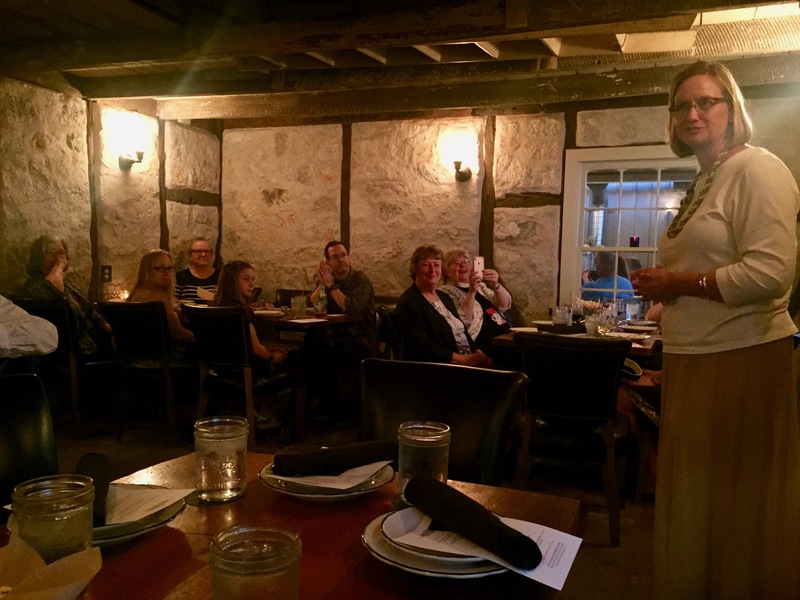 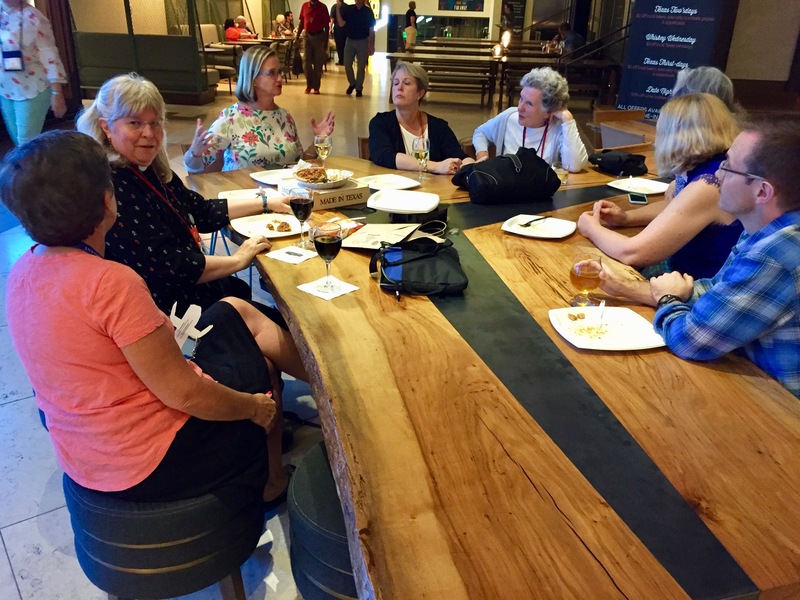 There was such a crowd at the dinner that some of us got little to eat but the conversations were worth it. 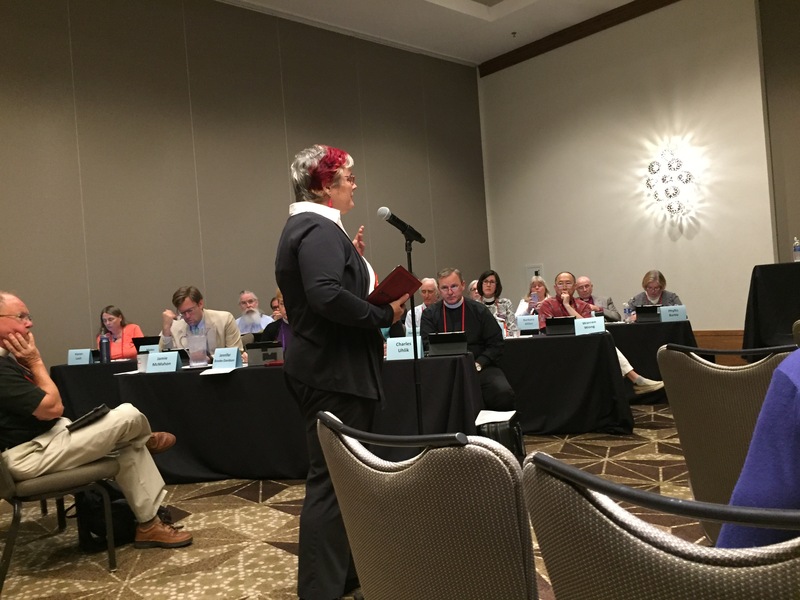 My Austin Hilton hotel room lights seem to be possessed. 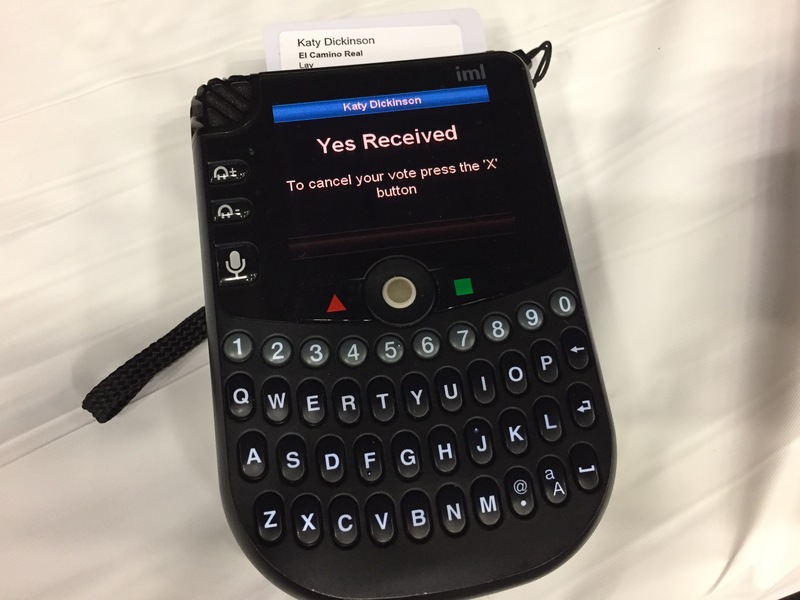 They turn off and on at random. 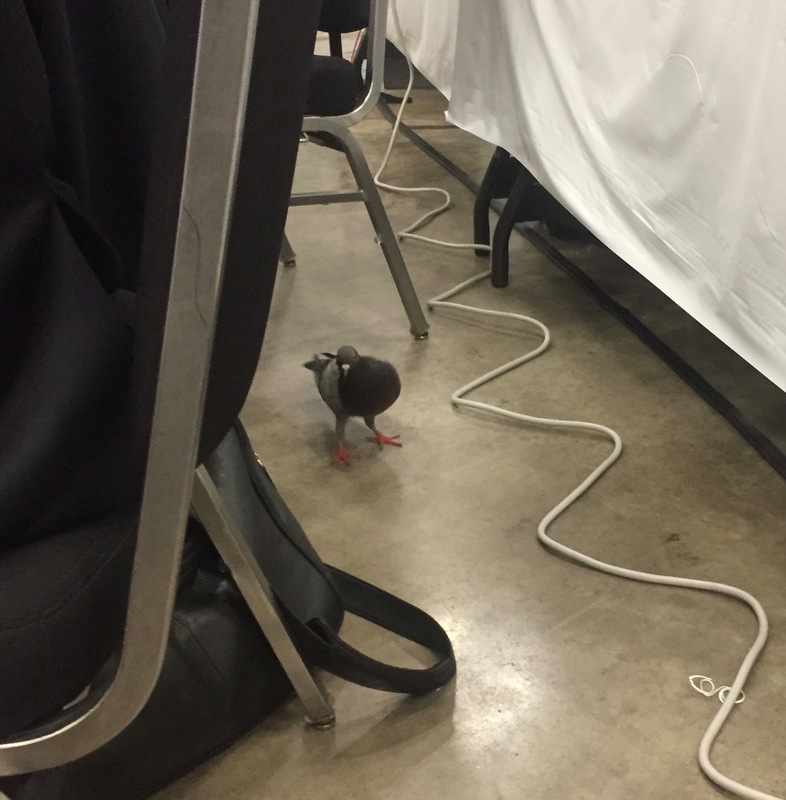 Sometimes in the middle of the night I will wake up because all the lights have suddenly switched on. 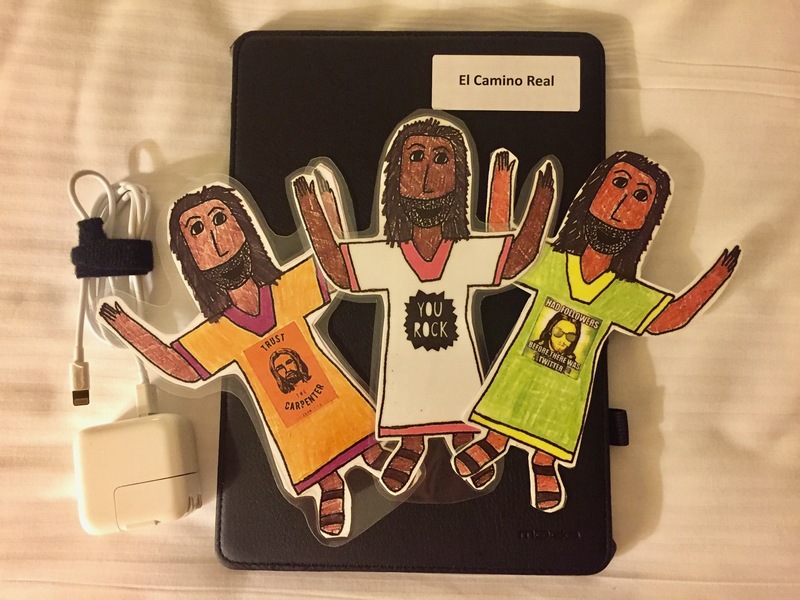 In the last four days, I have had the hotel technical staff look at the problem three times. 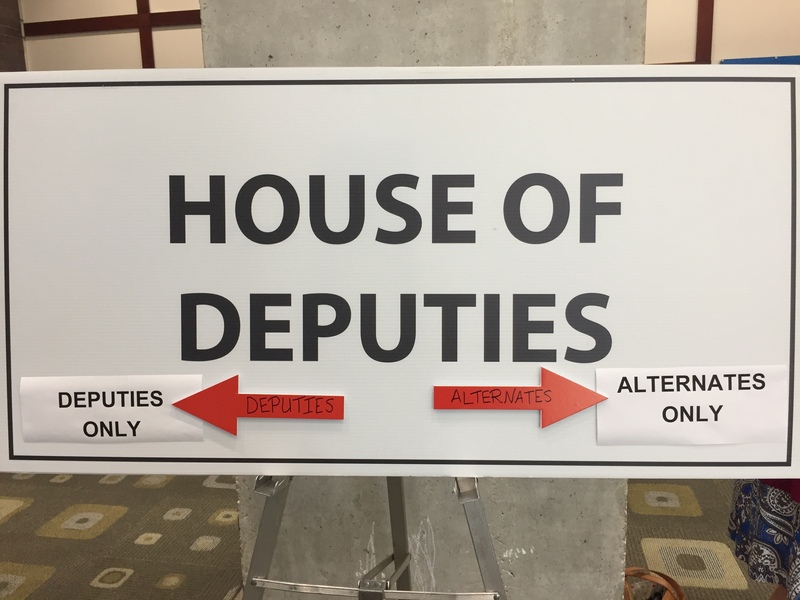 I do hope it is now fixed! 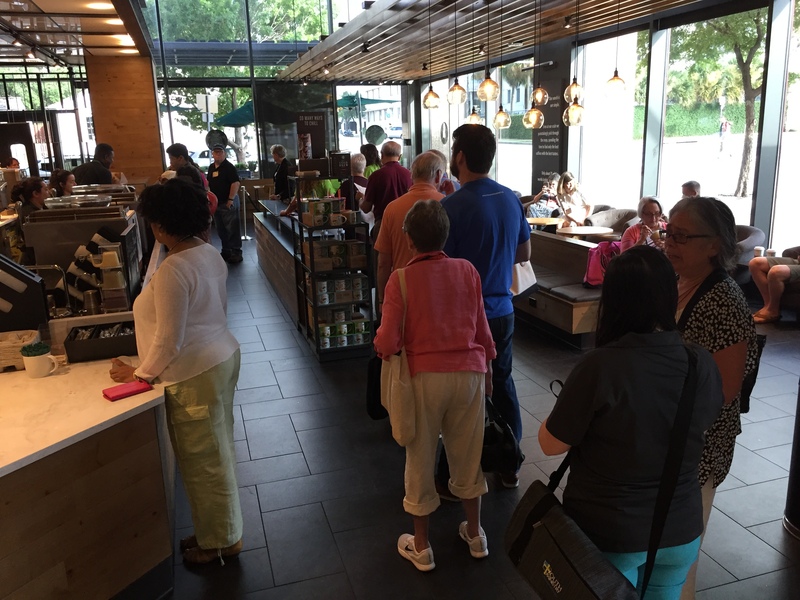 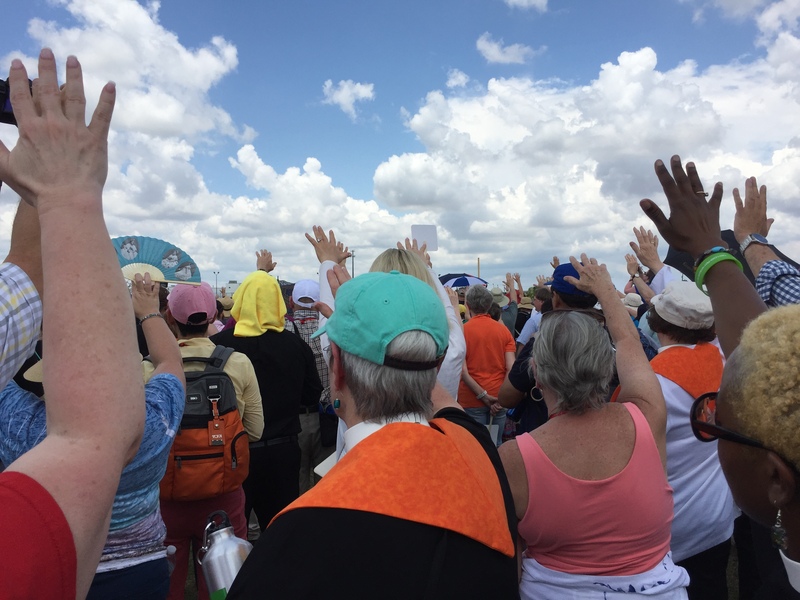 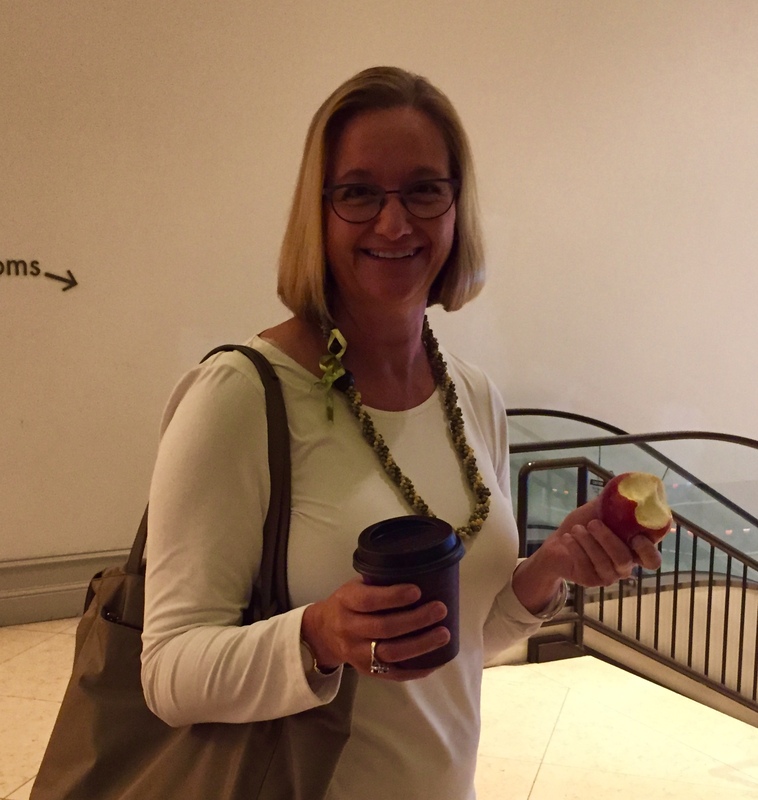 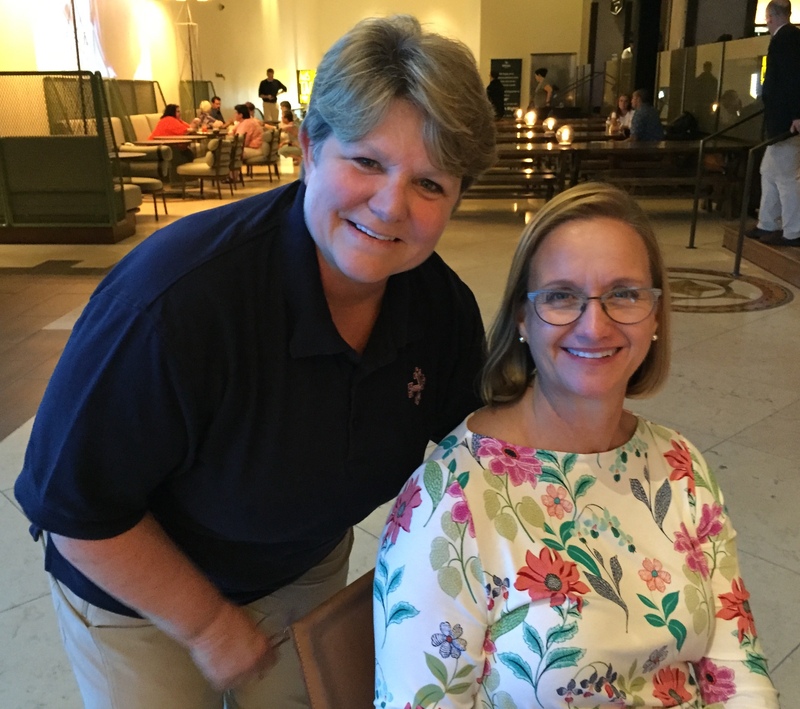 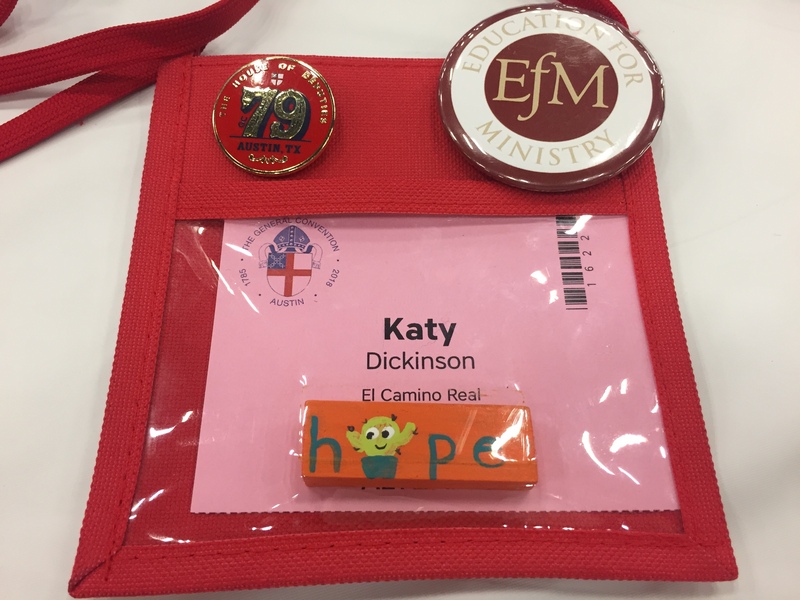 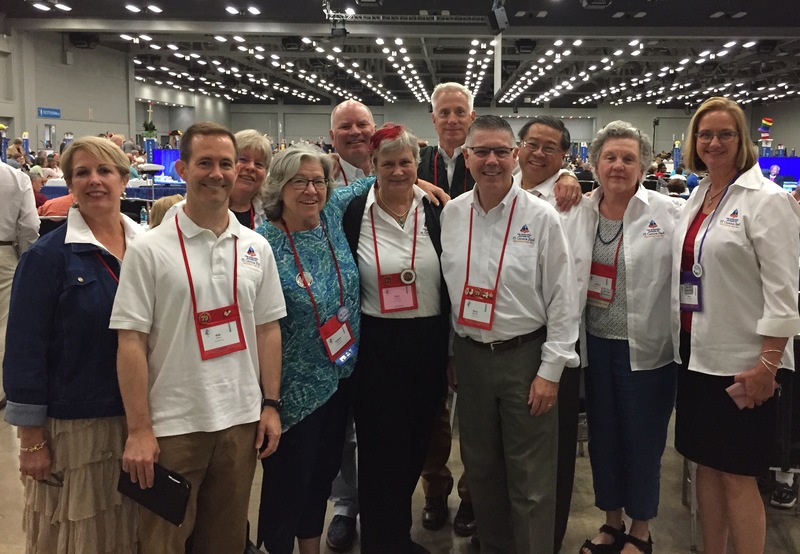 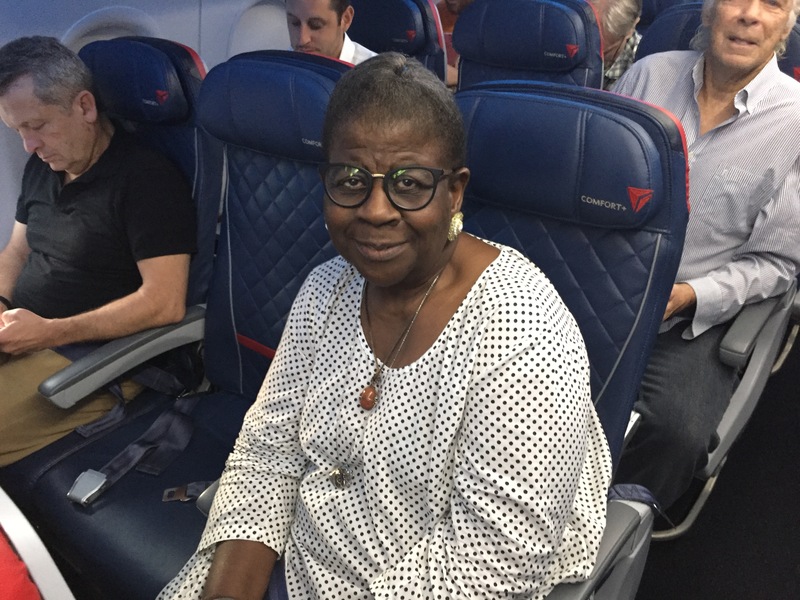 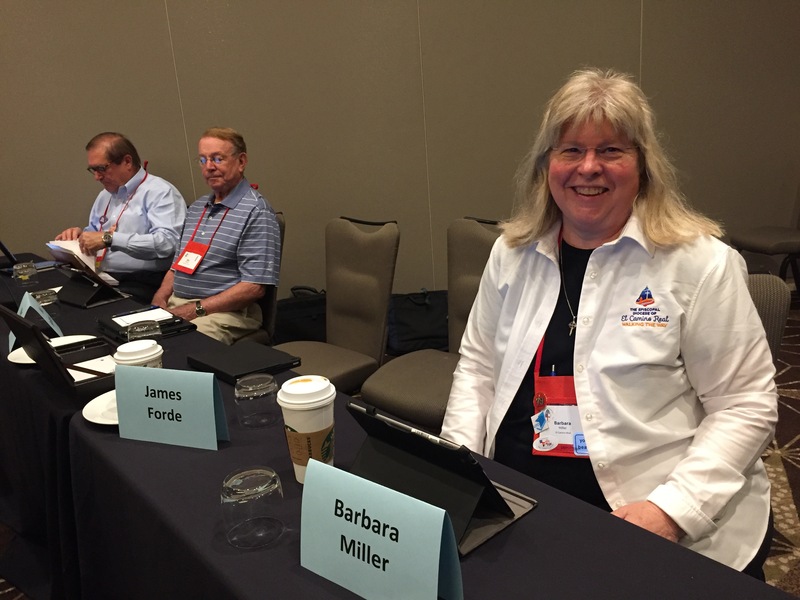 These blog posts and other GC79 news are now posted on the Diocese of El Camino Real website. 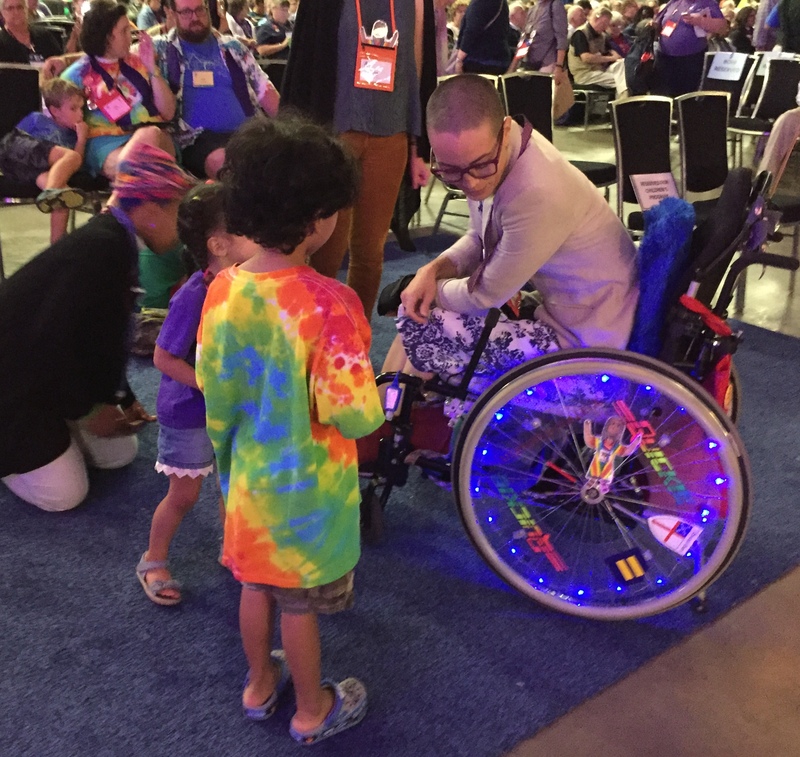 Thanks, Elrond!